Over Labor Day, I went to the New York State Fair with a few girlfriends. We stuffed ourselves with greasy fair food, rode the ferris wheel, and saw lots of cute little animals! The following weekend, I went to visit my mom and dad in Alexandria, VA, their new home! We went to see Luke Bryan and Jason Aldean on Saturday night. Both were awesome! And we had Maryland crabs for lunch to celebrate my dad's birthday. Last weekend, I went to my friend Natalia's wedding in the Hamptons. Every single detail was so beautiful and the wedding was so much fun. And their band was awesome, which meant that we danced the night away! Plus, I got to catch up with my girlfriends and I was reminded of how lucky I am to have such amazing friends. The next few weeks: Nuit Blanche in Ottawa this weekend, Beau's Oktoberfest next weekend, Canadian Thanksgiving plus a visit from my parents, and then another visitor to Ottawa! But, you all come here for recipes, and I have an amazing recipe for you today!! When I first heard about these cookies from Eat Live Run, I knew that I would have to make them. I had tried making some almond butter cookies for a roadtrip that I took last summer, but everyone hated them. So, I've been on a hunt ever since for a better almond butter cookie recipe and I'm happy to report that this one is a winner. It may even become my go-to cookie recipe. These bad boys are amazing. So chewy, so chocolate-y, so delicious. You need to whip up a batch immediately (that's why I'm posting this today, so you have no excuses over the weekend)! With an electric mixer, cream together the coconut oil, almond butter, granulated sugar and brown sugar until well blended. Add vanilla extract and ground flax and water mixture. Blend until everything is combined. In another bowl, mix together the oats, baking soda, salt, and cinnamon. Add dry mixture to wet ingredients and mix until just combined - be careful not to overmix! Stir in chocolate chips. Roll small balls of dough and place three inches apart on a silpat or parchment paper-lined sheet tray. Do not flatten dough balls. Bake at 350°F for 10-12 minutes until puffy. Let cool for 5 minutes on sheet tray before transferring to cooling rack to cool completely. Pictures from the events described above! 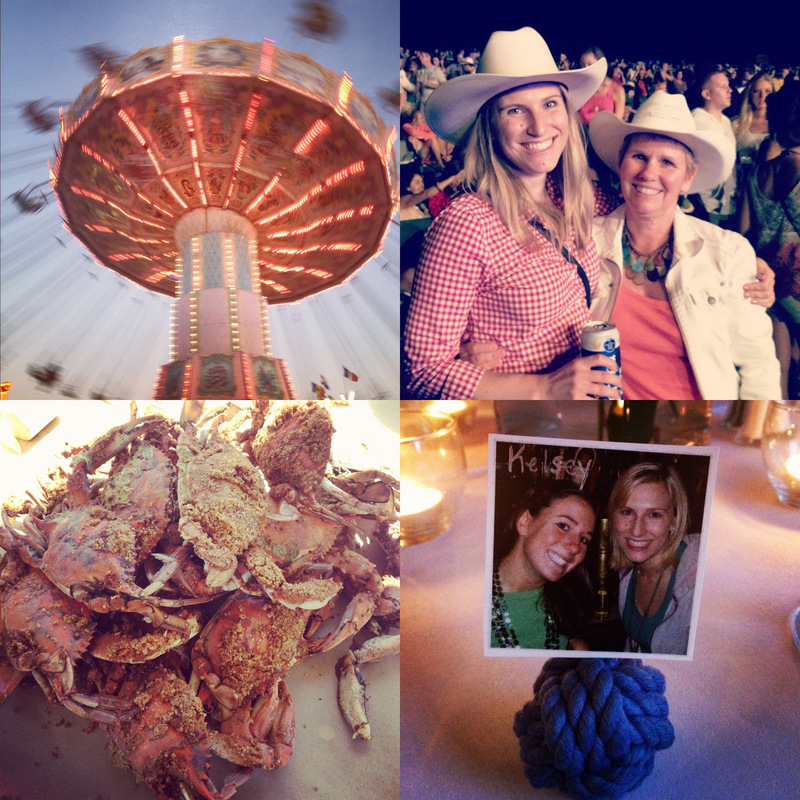 Swings at the New York State Fair, K&K Cowgirls at Jason Aldean and Luke Bryan in Bristol, VA, Maryland crabs, and cute place cards at Nat & Dan's wedding! These ones are seriously sooo good! That is a very busy fall, sounds fun! These sound awesome! Marked for future baking.